This International Event is held once a year. This event is aimed at cultural exchange for citizens, by using international foods and dancing. And this experience will become the start of exchange between Japanese and non-Japanese neighbors. We want participants (groups or individuals) who support our aim to join us. Please join our event and have fun! Tent Exhibitor [Participating Groups] WANTED ! 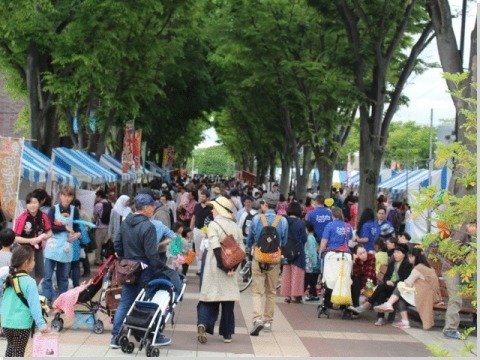 ② General booths for selling items, introducing your activities, or holding workshops. Please refer to the registration guide(p6) with regards to which booth you can use for your purposes. You can participate in the event by using one of the tents that the sponsor sets up in the Fair area. It is necessary to apply to the public health center in some cases. Participation is mandatory for all groups who apply. We will collect the registration fee at this time. Please note that there will be no refund for any cancellations after the orientation. we will hold a lottery at the orientation meeting. Priority to groups and companies in the city in the case of a lottery, we will make groups and companies operating within Tsukuba City a priority. we will make groups and companies which did volunteer work through Tsukuba International Association within a year a priority. We will ask all applicants who will handle food to follow procedures at a Public Health Center in Tsukuba. In the case, a separate fee will be charged. The price includes the delivery Group name panel and 2 desks and 2 folding chairs. Additional fee will be charged if you want to order separately. *You must have a fire extinguisher if your booth activities involve the use of fire. *Gas cylinders will not be provided. If you need gas cylinders, please arrange to bring them. Please submit three kinds of documents[ Application, Agreement , The report of activities ]. How to submit : Come to the office directly / FAX / by regular mail / E-mail. MC and PERFORMER WANTED ! MC of International Stage by Japanese and English or Japanese and other languages(2 person). Stage performance of foreigner, and traditional music and dancing (10 kinds of performances). Please submit application of documents.